-SG- Most people with an interest in the pre-war racing scene will be aware that the Amateur TT of the twenties came to a somewhat ignominious end after the 1929 event. The reason was simple: it transpired that quite a large number of the supposedly amateur competitors were being paid - quite well in some cases - in addition to receiving free parts and practical assistance from the trade. The ACU instituted an enquiry into the matter and finally announced in late December 1929 that over twenty riders were suspended and excluded from any awards they would otherwise have received. This included the Senior Winner J D Potts, who had come home first on a JAP engined Grindlay Peerless fitted, I believe, with Castle forks. 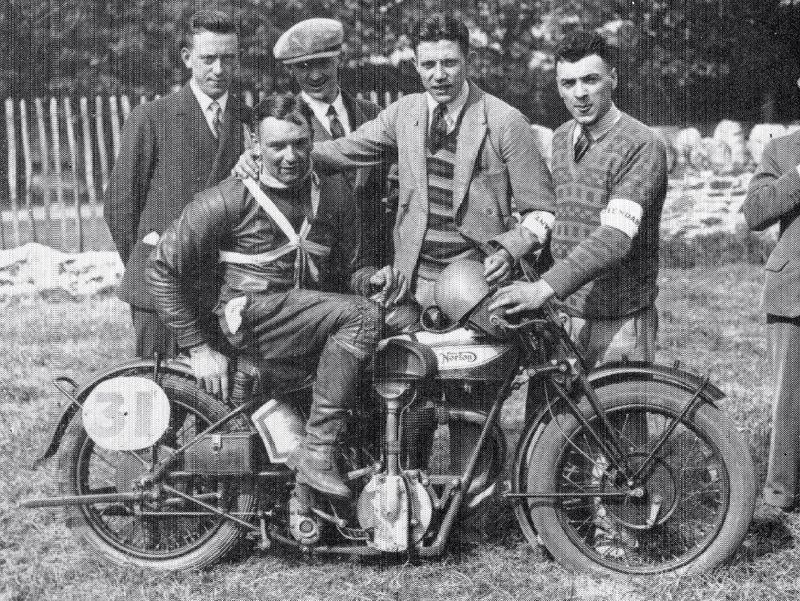 Second place-man, twenty two year old Eric Lea, who had already won the Junior event on a Velocette (the actual winner was disqualified for receiving help from onlookers), was thus elevated to the position of winner of the Senior nearly four months after it had taken place! He became the only rider to win the Junior and Senior events in the Amateur series, in the same year. And his machine? A very standard looking CS1 shown in the photo above. He averaged over 64 mph and by the looks of his footrest, must have had an 'off' at some point. Eric had previously ridden in the '28 Senior event and finished 6th - also on a Norton - but I do not know if it was another CS1 or even the same machine. He went on to ride in the 1931 Manx Grand Prix, retiring on his Norton in the Senior and finishing 11th on a Velocette in the Junior.